This article is about blood as human and animal food. For vermin sucking blood, see Hematophagy. Many cultures consume blood as food, often in combination with meat. The blood may be in the form of blood sausage, as a thickener for sauces, a cured salted form for times of food scarcity, or in a blood soup. This is a product from domesticated animals, obtained at a place and time where the blood can run into a container and be swiftly consumed or processed. In many cultures, the animal is slaughtered. In some cultures, blood is a taboo food. Blood is the most important byproduct of slaughtering. It consists predominantly of protein and water, and is sometimes called "liquid meat" because its composition is similar to that of lean meat. Blood collected hygienically can be used for human consumption, otherwise it is converted to blood meal. Special fractions of animal blood are used in human medicine. Blood sausage is any sausage made by cooking animal blood with a filler until it is thick enough to congeal when cooled. Pig or cattle blood is most often used. Typical fillers include meat, fat, suet, bread, rice, barley and oatmeal. 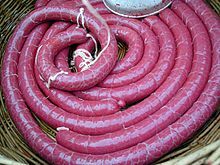 Varieties include biroldo, black pudding, blood tongue, blutwurst, drisheen, kishka (kaszanka), morcilla, moronga, mustamakkara, sundae, verivorst, and many types of boudin. Blood pancakes are encountered in Galicia (filloas), Scandinavia, and the Baltic; for example, Swedish blodplättar, Finnish veriohukainen, and Estonian veripannkoogid. Blood soups and stews, which use blood as part of the broth, include czernina, dinuguan, haejangguk, mykyrokka, pig's organ soup, tiet canh and svartsoppa. Blood is also used as a thickener in sauces, such as coq au vin or pressed duck, and puddings, such as tiết canh. It can provide flavor or color for meat, as in cabidela. Blood can also be used as a solid ingredient, either by allowing it to congeal before use, or by cooking it to accelerate the process. Blood curd is a dish typically found in Asia that consists of cooled and hardened animal blood. In China, "blood tofu" (Chinese: 血豆腐; pinyin: xuě dòufǔ) is most often made with pig's or duck's blood, although chicken's or cow's blood may also be used. The blood is allowed to congeal and simply cut into rectangular pieces and cooked. This dish is also known in Java as saren, made with chicken's or pig's blood. Blood tofu is found in curry mee as well as the Sichuan dish, Mao Xue Wang. Chinese people use pig blood, tofu, and vegetables to make a healthy soup. Pig blood is rich in vitamin B2, vitamin C, protein, iron, phosphorus, calcium, niacin and other nutrients, while tofu is good for the liver and stomach, and therefore this soup has a reputation as a healthy and tasty meal in China. In Hungary when a pig is slaughtered in the morning, the blood is fried with onions and served for breakfast. In Korea, blood curd is typically made of cattle blood and is often used as an ingredient for different kinds of soups and stews, such as hangover soup. In Tibet, congealed yak's blood is a traditional food. 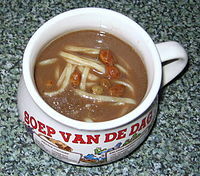 In Vietnamese cuisine pig blood curd is used in soup based noodles dishes such as Bún bò Huế or Bánh canh. The USSR and ex-USSR countries produce sweet nutrition bars containing cattle blood, known under the generic name Hematogen; originally created for treating anemia, they are also used like regular sweets nowadays. The Catholic Church, as well as the Eastern Orthodox, Oriental Orthodox, and some Anglican churches, believe that in the sacrament of the Eucharist, the participants consume the real blood and body of Jesus Christ. The post-communion prayer of the 1662 Anglican Book of Common Prayer describes the meal as "spiritual food". Many other Christian denominations symbolically consume the Eucharist. However, nowhere in Christianity is the drink consumed at the Eucharist actual blood, even among denominations believing in transsubstantiation (the sacramental transformation of the bread and wine into the Body and Blood). The liquid consumed is typically wine or grape juice. The consumption of actual blood is in fact forbidden according to the book of Leviticus, part of both Jewish and Christian holy scriptures. The "words of institution", which includes the words Jesus said to his Disciples at the Last Supper, would have been surprising and even unsettling to those present for this reason, especially as the Last Supper was a Passover seder. The ban on consumption of blood by Christians was affirmed after Jesus' death by the Apostolic Decree, chronicled in the Acts of the Apostles. Some cultures consider blood to be a taboo form of food. In Abrahamic religions, Jewish and Muslim cultures forbid the consumption of blood. Blood and its by-products are forbidden in Islam, in the Qurʼan, surah 5, al-Maʼidah, verse 3. In the New Testament, blood was forbidden by the Apostolic Decree (Acts 15:19-21) and is still forbidden among Greek Orthodox. See also Biblical law in Christianity and Communion (Christian). The Igbo ethnic group of Nigeria has no explicit prohibitions against eating blood, but most regard it with disgust and refuse to eat any meat perceived as "bloody" or undercooked (such as raw meat in sushi or steak prepared raw, rare, or medium). Goats, cattle, and other animals slaughtered in the traditional Igbo manner are dispatched with a single cut across the neck and then most or all of the blood is allowed to slowly drain from the wound. This practice may have been influenced by the Igbo Jewish community that apparently predates contact with Europe. Many Igbos who buy butchered, packaged meat from groceries and supermarkets are in the habit of washing the blood from the meat with water before preparing it. The taboos may be rooted in the fact that consuming greater quantities of blood is actually poisonous. Among the Maasai people, drinking blood from cattle is a part of the traditional diet, especially after special occasions such as ritual circumcision or the birth of a child. As in Europe, several varieties of blood sausage are also popular in Mexico and the southwest United States (moronga), Peru (relleno), Chile (prietas, ñache), Argentina, Uruguay, and Puerto Rico (morcilla). In Brazil, the traditional Portuguese dish known as cabidela (see above) is also eaten. Yaguarlocro in Ecuador is a potato soup made with sprinklings of goat's blood. In the western region of Santander Colombia, a dish called pepitoria is made from rice cooked in goat blood. Mexicans from certain regions eat goat's stomach stuffed with pork blood and vegetables as a delicacy. In China and some regions of Southeast Asia, coagulated chicken, duck, goose or pig blood, known in Chinese as "blood tofu" (Chinese: 血豆腐; pinyin: xiě/xuè dòu fǔ) is used in soups. In Taiwan, pig's blood cake (simplified Chinese: 猪血糕; traditional Chinese: 豬血糕; pinyin: zhū xiě/xuè gāo) is made of pork blood and sticky rice. It is fried or steamed as a snack or cooked in a hot pot. In the South Indian state of Tamil Nadu, stir-fried lamb blood is a common dish had for breakfast and lunch. When prepared alone it is called raththam poriyal. More commonly it is stir-fried with lamb stomach and intestines with spices like ginger, garlic, cloves, cinnamon, red chili powder, green chilies, coriander powder, cumin, shallots and grated coconut. This dish is very common in the Madurai and Kongu Nadu region of Tamil Nadu. In the coastal Konkan region of India, Sorpotel, a dish of Portuguese origin is commonly cooked that includes parboiled meat and offal which is cooked in a spicy and vinegary sauce. Some people also use the animals' blood for boiling the curry. Sorpotel is primarily made by Catholics of Goa, Mangalore and East Indians of Mumbai. In Indonesia, especially the Batak tribe in North Sumatera, pig's blood is used as an ingredient and sauce mixed with andaliman (Zanthoxylum acantophodium) for a cuisine named Sangsang (read saksang). During the Indonesian mass killings of 1965-1966 certain death squad members drank the blood of their victims as they believed it would prevent them from going crazy. In Korea, blood as food is known as seonji (선지 [sʌn.dʑi]; derived from the Manchu word senggi (ᠰᡝᠩᡤᡳ) meaning "blood"). Coagulated cattle seonji and dried radish greens are added to the beef legbone broth in order to make seonji-guk (blood curd soup). Sundae, a blood sausage made generally by boiling or steaming cow or pig's intestines that are stuffed with various ingredients, such as pig's blood, cellophane noodles, kimchi, scallions, etc. Coagulated chicken, duck, goose or pig blood is used in soups, such as the classic Thai dish Tom Lued Moo (pork blood soup). Thailand also has a dish known as Nam Tok, which is a spicy soup stock enriched with raw cow or pig's blood. It is often used to enrich regular noodle dishes, as well as in Khao soi. In Laos and Northeast Thailand), a raw version of laap, a meat salad, is made with minced raw meat, seasoned in spices, and covered with blood. The spicy noodle soup Nam ngiao and certain variants of Khao soi of the cuisine of Shan State and Northern Thailand contain diced curdled blood. In the Philippines, a popular dish called dinuguan is made from pig's blood and seasoned with chili and is traditionally eaten with steamed rice. The northern tradition calls for stir frying both the seasoned blood and chosen meat with vinegar until dry. This is known as "dinardaraan" in the north but also known as "crispy dinuguan" in other areas. In Vietnam, congealed pork blood is used in Bun bo Hue (a spicy noodle soup), as well as congee (a type of rice porridge). It is simply solidified, then put into the broth to absorb the flavor. Blood is also consumed raw in Vietnam although it is not so popular nowadays due to health concern and a better understanding of how raw blood may contain parasites and other organisms that are harmful to human. This type of raw blood dish is called "tiet canh", literally translated as "blood soup". As its name suggests, the soup is prepared with raw and uncooked animal blood. Firstly, blood is collected when the animal is slaughter, then it is mixed with a little bit of fish sauce or salt water to prevent it from congealing (this step varies a lot from people to people and from region to region), this is to have time to prepare the other part of the dish, usually a mixture of the slaughtered animal's heart, liver, stomach, some time, its kidney, being diced and cooked. Then, the cooked mixture is divided into serving portions. The blood is now mixed with regular drinking water (there is specific ratio between the blood and the water), then it will be poured onto the cooked mixture. After 10-15 minutes, the blood will start to congeal and the final product will have a consistency similar to jelly. 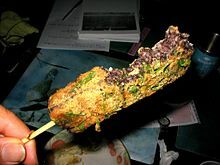 Various herbs, roasted and smashed peanut are topped on the congealed blood to enhance its flavor. This dish is usually made with pig's blood and duck's blood but it can also be made from any type of animal's blood. In China and Vietnam certain types of snake blood are considered to be an aphrodisiac, and are drunk with rice wine. In northern region of Nepal, Gyuma a blood sausage is a popular dish commonly eaten by locals. It is made up on Yak's blood and meat. The fillings also include buck wheat flour and other spices. The sausage is also used in lentils or prepared in stir fry dishes. In Finland, pig's blood is used, with milk, flour and molasses, to make blood pancakes veriohukainen, usually served with lingonberry jam. Also different style of sausages are common, mustamakkara and ryynimakkara. In Åland and Bothnia region is also mustaleipä or verileipä that are bread where liquid of the batter either totally or partially blood. Blackpudding veripalttu is available is some parts of the country. In Northern Germany pig's blood used to be traditionally mixed with vinegar, scraps, spices and sugar to make schwarzsauer. It's eaten warm or preserved in jars. Changes in taste and lifestyle have made this an uncommon dish. In ancient Lakedaimon, the Greek city-state of Sparta, the black broth was common: a soup with pork meat and blood. In Hungary, hagymás vér (pan-fried porcine blood with onions) and véres hurka (a kind of blood sausage made with pig's blood, bacon, pork, rice, onion, salt and various herbs and spices) are common winter foods. In Italy, the sanguinaccio dolce is a pudding made with pig blood, chocolate, sugar, pine nuts, raisins and milk. In Portugal, the northern region known as Minho has a traditional blood soup named papas de sarrabulho. "Papas" translates as "mash" and "sarrabulho" is a popular expression for coagulated blood, so the literal translation would be "mashed blood". The soup is made with pig's blood, chicken meat, pork, ham, salami, lemon and bread, and is typically sprinkled with cumin, which provides the dish with its distinctive odor. It is usually served in the winter because it is a rather heavy dish. The dish is seldom eaten in Southern Portugal. Also very popular, is morcela sausage, a type of black pudding. Another traditional Portuguese dish known as cabidela is also made by cooking chicken or rabbit in its own blood, sometimes diluted with vinegar. In Spain, the morcilla sausage is a kind of black pudding mainly made with pig blood, with spices, fat, and sometimes vegetables. In Andalusia sangre encebollada and Valencian sang amb ceba are popular dishes made with chicken or pork solidified blood and onion. In Sweden, the blood soup svartsoppa, made with goose blood, is traditionally eaten on the eve of Saint Martin, especially in the southern region of Skåne. Other popular dishes, with blood as one of the ingredients include blodpudding (black pudding], blodplättar (blood pancakes), blodpalt (potato dumplings flavoured with reindeer or pig blood) and paltbröd (bread with blood in it, which is dried and boiled and eaten together with fried pork and bèchamel or onion sauce). In Britain, Ireland, and some Commonwealth countries, "black pudding" or "blood pudding" is made from blood and some filler grains and spices, often oatmeal. Blood sausage is also popular in Norway (blodpølse), Sweden (blodkorv), Finland (mustamakkara) and Baltic states Latvia (asinsdesa) and Estonia (verivorst), as well as in Poland (kaszanka), Germany (blutwurst), Austria (blunzen), Hungary (véres hurka), Spain (morcilla, botifarra), Croatia (krvavica), Slovakia (krvavnička), Romania (sângerete), Slovenia (krvavica), Ukraine (krovyanka) and France (boudin). In Montgomeryshire, Wales, goose blood was used to make a pastry tart at Christmas time. In Ireland, there is ample evidence of the persistence of the practice of bleeding live cattle until well into the 19th century. It was considered to be a preventative measure against cattle diseases, and the blood drawn, when mixed with butter, herbs, oats or meal, provided a nutritious emergency food. ^ Davidson, Alan. The Oxford Companion to Food. 2nd ed. UK: Oxford University Press, 2006., p. 81-82. ^ "Soy protein alleviates symptoms of fatty liver disease, study suggests". ^ "Blood tofu: bloody delicious? - China.org.cn". china.org.cn. ^ "10 Hungarian eating habits that make foreigners go nuts". ^ Cho, Christine (2 December 2016). "[The Palate] Haejangguk, beyond the hangover". The Korea Herald. Retrieved 15 August 2017. ^ Ma Jian, Stick Out Your Tongue Chatto and Windus London, 2006. ^ Borré, Kristen. "Seal Blood, Inuit Blood, and Diet: A Biocultural Model of Physiology and Cultural Identity." Medical Anthropology Quarterly 5 (1991): 48–62. ^ Karl Josef von Hefele's commentary on canon II of Gangra "NPNF2-14. The Seven Ecumenical Councils". Retrieved 11 October 2010. notes: "We further see that, at the time of the Synod of Gangra, the rule of the Apostolic Synod with regard to blood and things strangled was still in force. With the Greeks, indeed, it continued always in force as their Euchologies still show. Balsamon also, the well-known commentator on the canons of the Middle Ages, in his commentary on the sixty-third Apostolic Canon, expressly blames the Latins because they had ceased to observe this command. What the Latin Church, however, thought on this subject about the year 400, is shown by St. Augustine in his work Contra Faustum, where he states that the Apostles had given this command in order to unite the heathens and Jews in the one ark of Noah; but that then, when the barrier between Jewish and heathen converts had fallen, this command concerning things strangled and blood had lost its meaning, and was only observed by few. But still, as late as the eighth century, Pope Gregory the Third (731) forbade the eating of blood or things strangled under threat of a penance of forty days. No one will pretend that the disciplinary enactments of any council, even though it be one of the undisputed Ecumenical Synods, can be of greater and more unchanging force than the decree of that first council, held by the Holy Apostles at Jerusalem, and the fact that its decree has been obsolete for centuries in the West is proof that even ecumenical canons may be of only temporary utility and may be repealed by disuse, like other laws." ^ Is It Safe to Drink Blood? ^ Craats, Rennay (2005). Maasai. Weigl Publishers. p. 25. ISBN 978-1-59036-255-6. ^ Oppenheimer, Joshua, director. The Look of Silence. The Look of Silence, Drafthouse Films, 2014, thelookofsilence.com/. ^ "Seonji" 선지. Korean-English Learners' Dictionary. National Institute of Korean Language. Retrieved 15 August 2017. ^ Holliday, Graham (17 April 2017). "Eating Korea: 10 of South Korea's most delicious dishes". CNN Travel. Retrieved 15 August 2017. ^ a b "Shan (Tai) Cooking: Khao Soy Tai or Shan Kao Soi by Sao Tern Moeng". ^ "Glossary of Finnish dishes". Retrieved 11 October 2010. ^ Wilson Trotter, Carol Christopher (2012). The Whole Hog: recipes and lore for everything but the oink. Pavilion. p. 259. ISBN 9781909108370. ^ "Goose Blood Tart". National Museum Wales. Wikimedia Commons has media related to Blood-based food.